Mountain Indigo Bush is a member of the Pea Family and takes the form of a slender many-branched, evergreen subshrub. It grows to 16 inches in height and has dark green leaves which grow in groups of 7-15 leaflets each to 3/8 inches in length. 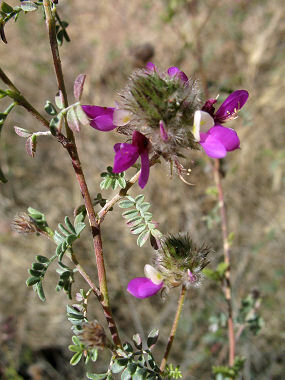 The plant grows in canyons and hills at elevations between 2000-6500 feet. Mountain Indigo Bush is browsed by deer and pollinated by bees. Mountain Indigo Bush blooms between March and June and produces a pea-like flower, the largest petal of which is cream colored, while the remaining are purple.